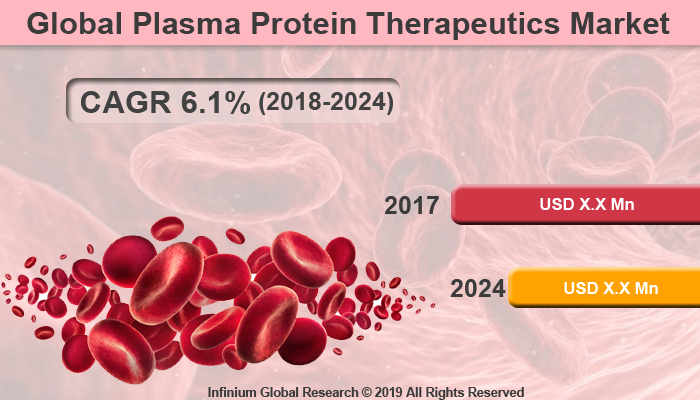 A recent report published by Infinium Global Research on plasma protein therapeutics market provides in-depth analysis of segments and sub-segments in the global as well as regional plasma protein therapeutics market. The study also highlights the impact of drivers, restraints, and macro indicators on the global and regional plasma protein therapeutics market over the short term as well as long term. The report is a comprehensive presentation of trends, forecast and dollar values of global plasma protein therapeutics market. According to the report, the global plasma protein therapeutics market is projected to grow at a CAGR of 6.1% over the forecast period of 2018-2024. The plasma proteins are also known as Blood proteins that present in the in blood plasma. They offer several transport functions in the human body. The plasma-based and recombinant biological therapeutics are used to treat several conditions including immune deficiencies, autoimmune disorders, neurological & bleeding disorders, and others. This is unique biologic medicine that is either infused or injected in the human body to treat various rare disease. Rapidly growing occurrence of immunodeficiency disorders (PIDs) and neurological disorders are the major factor that driving the growth of plasma protein therapeutics market worldwide. The plasma protein therapeutics is the most popular in the treatment of immunodeficiency disorders. Additionally, the rising use of plasma-derived products for the treatment of several rare diseases is contributing to the growth of plasma protein therapeutics market. However, strict regulations for the handling of plasma protein products are hampering the growth of plasma protein therapeutics market. Moreover, growing geriatric populations, technological advancements, and increasing acceptance of plasma products are expected to escalate the growth of plasma protein therapeutics market in upcoming years. The ongoing research and development in the plasma protein are anticipated to drives its use across several applications. The growing use of Therapeutic protein drugs in the treatment of a wide variety of clinical indications are projected to create several growth opportunities for this market in upcoming years. Rapidly growing awareness about the plasma protein therapies is likely to favor the growth of the market in the forecast period. Among the geographies, North America is dominating the plasma protein therapeutics market followed by Europe. The high research and development in the advanced therapeutic sector and the high occurrence of rare diseases are the major factors that drive the North America plasma protein therapeutics market. Furthermore, Asia Pacific is the fastest growing region in the plasma protein therapeutics market. The rapidly growing healthcare infrastructure, growing awareness of plasma protein therapeutics and rising geriatric populations are the factors that projected to create several opportunities for this market in the Asia Pacific region. The report provides deep insights into the demand forecasts, market trends, and micro and macro indicators. In addition, this report provides insights into the factors that are driving and restraining the growth in this market. Moreover, The IGR-Growth Matrix analysis given in the report brings an insight into the investment areas that existing or new market players can consider. The report provides insights into the market using analytical tools such as Porter's five forces analysis and DRO analysis of plasma protein therapeutics market. Moreover, the study highlights current market trends and provides forecast from 2018-2024. We also have highlighted future trends in the market that will affect the demand during the forecast period. Moreover, the competitive analysis given in each regional market brings an insight into the market share of the leading players.